Thousands of Maryland workers work full-time but don’t earn enough to make ends meet. That’s why the Fight for $15 Maryland Coalition is calling on the state legislature in Annapolis to stand up for its hard-working people and raise the state’s minimum wage from $9.25 to $15.00 per hour by 2023! Kara from The Arc Central Chesapeake Region did a great testimony, she is a Direct Service Professional (DSP) on the Eastern Shore of Maryland. She spoke freely about her passion for the work she does daily with people with intellectual and developmental disabilities, her struggles as a single mother and tough choices she has had to make. She supports the Fight for $15.00! The committee room and hallway were packed with advocates for the Fight for $15 bill (HB166) hearing. We are grateful to Del. 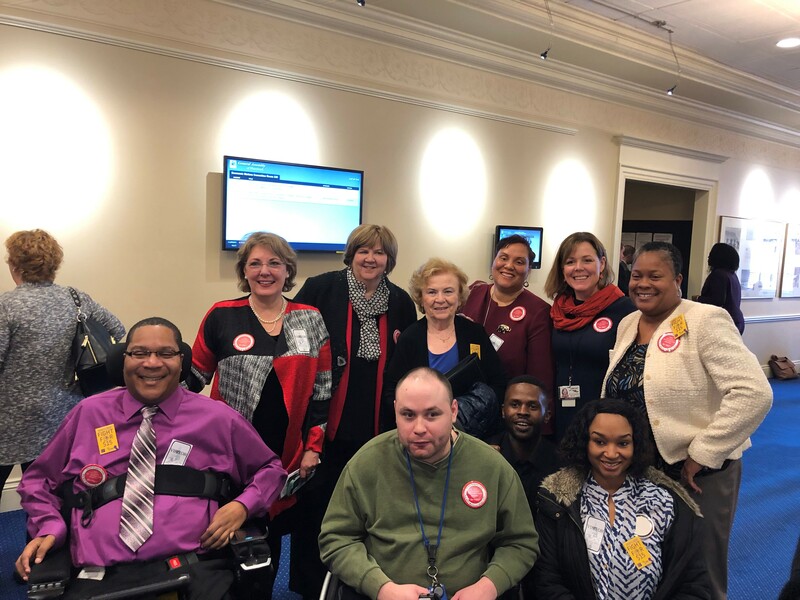 Diana Fennell and other sponsors for putting together a bill that includes provisions for DD Community Services funding; to ensure that Direct Support jobs do not become minimum wage jobs. Raising the minimum wage to $15 for all workers will benefit over 700,000 households in Maryland.